The slow pace of change in the flash-manufacturing industry means that prices of SSDs will likely hold steady compared to 2013, but price hikes could be in the offing. In short, expect to spend about 75 cents per gigabyte (GB) on an SSD in 2014, according to Jim Handy, an analyst with Objective Analysis. The average capacity drive that makers produce should be about 200GB—relatively tiny as far as consumer storage goes, but in line with corporate policies that call for keeping data on corporate servers where it can be managed. And while some manufacturers try to differentiate their products through technologies that can improve performance, it’s not clear how much they’re succeeding. That’s forcing SSD manufacturers into direct competition, where price is the differentiating factor. The bottom line is that SSDs still are a capacity game: people buy the largest amount of storage they can within their budget, and they ignore the rest, Handy said. 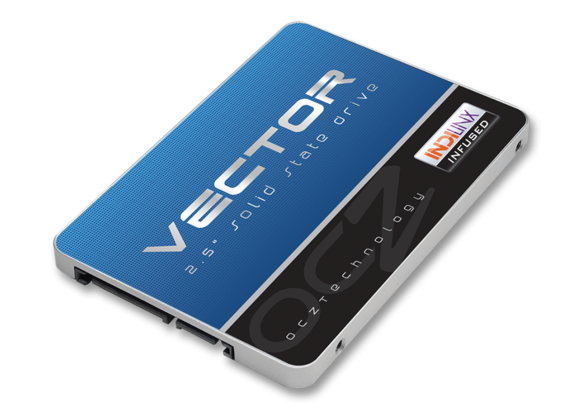 After being bought out by Toshiba, OCZ was on hand at CES 2014 to show off its recently-introduced Vector drives. The appeal of solid-state discs are undeniable, especially in an increasingly mobile world. Over the long run, flash chips within SSDs are generally faster and consume less power than a spinning, traditional hard drive. SSDs are also rugged, withstanding drops and jars that can cause a hard drive to crash. But SSDs are also more expensive on a dollars-per-GB basis than a hard drive, and if an SSD does fail—a real rarity these days, granted—data isn’t as recoverable as a hard drive. With that said, SSDs are one of the most effective upgrades for an older PC. They’re predicted to capture more and more of the storage market over time, with traditional hard drives remaining relatively static, according to iSuppli. SSDs are expected to gobble up the incremental demand for storage, according to iSuppli. Last September, a fire at DRAM provider SK Hynix helped stabilize the price of flash memory, as vendors shifted their flash manufacturing lines to meet the sudden shortage of DRAM. That helped lift flash prices, too—helped more by strong demand for Apple’s iPhone 5, according to Chris Geiser, a senior product marketing manager for memory and storage with Samsung, whose semiconductor division is the world leader in flash memory. But then, confusion: some topline manufacturers ended up dumping SSDs during Black Friday 2013, roiling the market. So, while capacity shortages may raise prices, nervous vendors needing to make sales goals may end up suddenly dumping drives. And that leaves some executives cautious. “I don’t know what the [2014 pricing] trend is going to look like, and that didn’t happen in 2013,” Geiser said. Executives at SanDisk, which has pledged to make SSDs 25 percent of its corporate revenue by the end of 2014, say that “for this year, pricing will remain in balance,” said Tarun Loomba, vice president of marketing for client storage solutions. The size of the typical solid-state drive still varies dramatically, precisely because of the differences between corporate customers and the general consumer. “[An SSD is] much smaller in a corporate environment than a consumer environment,” SanDisk’s Loomba said. “In a consumer environment, they want to ‘pack rat’,” storing virtually everything on a hard drive.” But an IT administrator feels the opposite, he said. Drive capacities also vary dramatically by form factor. 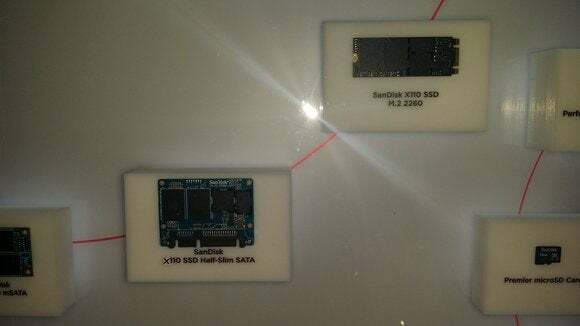 NAND manufacturers have to decide whether to design and sell their flash for SD cards inside cameras, for flash drives built into phones, or for SSDs inside a traditional laptop. 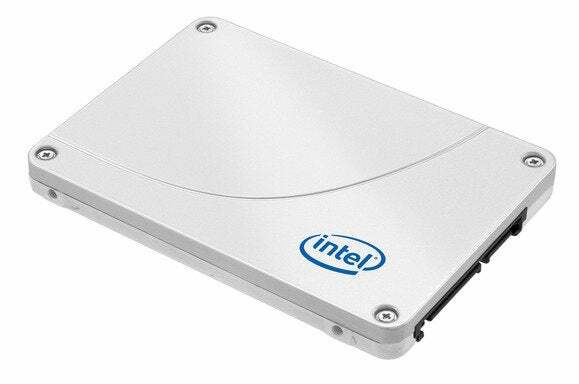 Those SSDs are typically built into a chassis that mimics a 2.5-inch drive. Space-constrained Ultrabooks, however, slip storage into just about wherever they can, inside different variations of what is now known as the M.2 form factor. SSDs manufactured in the M.2 form factor look more like DRAM modules than traditional hard drives. So while 1-terabyte drives that were designed for the 2.5-inch laptop form factor have fallen in price—the 960GB, 2.5-inch Crucial M500 costs just under $600 at Amazon—they’re still far out of price reach for most users. Meanwhile, the typical size of the SSD found within an Ultrabook is 128GB and isn’t expected to increase all that much, said Samsung’s Geiser. SSD makers have employed various strategies to increase the amount of data that can be stored in a given space, known as storage density. In mid-2013, for example, Samsung announced a 128-gigabit [gb], three-level, multi-level-cell flash chip designed for SSDs at 500GB and above. But MLC technology has also been linked to higher failure rates over time, as a 2012 examination by Microsoft indicated. At CES 2014, Mushkin and ADATA, among others, showed off whopping 2TB SSDs. But the drives aren’t ready to ship, and there’s no indication that the prices will be less than astronomical. Likewise, SSD makers have steadily tacked on higher-speed storage interfaces. moving from the 3-gb/s SATA interface to the 6-gb/s version. Plextor used CES 2014 to announce its M6e M.2, an SSD drive that uses the PCI Express bus typically reserved for graphics cards. The M6e M.2 delivers maximum sequential read/write speeds of up to 770MB/625MB per second and random read/write speeds of up to 105,000 and 100,000 IOs per second. Plextor will manufacture the drive in capacities of up to 512GB this spring. Pricing has not been undisclosed. In 2012, Samsung bought Nvelo, which created a “RAM cache” on a user’s PC that was even faster than the SSD itself. Samsung adapted the technology into its RAPID feature, pairing it with a technology called “turbo write,” which first appeared on the 840 Evo series. Turbo write treats part of the slower MLC flash as single-layer-cell flash, creating yet another cache that can catch up when the drive is idle. It’s a way to help differentiate Samsung drives, Geiser explained. But when it all boils down, most buyers are still concerned with the bottom line: maximizing the amount of storage, and minimizing the dollars spent.